I’m guilty of buying too many makeup products that I hardly ever use them up before their expiration date. As a beauty addict, I’m sure you can relate to this problem. Expired makeup and beauty products are dangerous to use as they can cause irritation, acne and other skin problems. However, it’s also such a waste to throw them away. Today, I want to share with you how I repurpose and reuse old eyeshadow by turning it into nail polish. We love stunning eyeshadows on our eyelids; why not rocking them on the fingers?! 1. Scrape the eyeshadow out of its metal pan. Make sure to finely crush the eyeshadow into powder. 2. Pour all the eyeshadow powder into a clear nail polish. Mine was from Wet n Wild. I believe it was .89 cent when I got it. You can use the one that you already have or get a new clear polish for very cheap at the drugstore. To prevent making a mess, I made a small cone out of paper and used it as a funnel to pour the eyeshadow. 3. Once the powder is inside the clear nail polish, shake it well. This is how mine turned out. The eyeshadow powder tends to sit at the bottom of the nail polish bottle after awhile so make sure to give it a good shake before every use. What do you think? I think I love the color even more than when it was an eyeshadow. 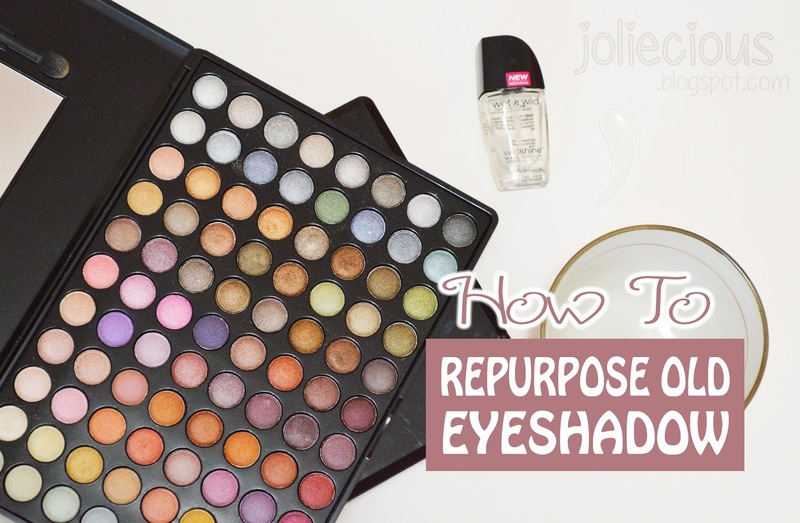 Do you have any other ways to repurpose or reuse old makeup products?